Is it really necessary to have a licensed contractor do some remodeling work on my home? While there are certainly capable contractors in most cities, a license assures the homeowner that the contractor has been tested and certified by the state, county or city. 1. Is the contractor qualified to do specific work… i.e. plumber, electrician, etc. ? 2. Does the contractor have the minimum amount of insurance as required by the various governmental agencies ? 3. Has the contractor taken a continuing educational course for his trade? 4. Are all subcontractors licensed also? This would include the electrician, plumber, air conditioning, tile roof, and many other trades. Florida lien laws are written to protect the home owner from overpayment and they also protect the subcontractor and assure payment. Unlicensed contractors demand a substantial deposit before work commences and frequently disappear before the work is completed. When you have verified a contractor’s license validity, he must produce a certificate of insurance. This applies to all the subcontractors as well. Next, the contractor must register a Notice of Commencement with the County Clerk’s office. If you are unsure about the necessity of a permit from the city or county, give the office a call and they will tell you what work requires a permit. The purpose of the permit is to regulate the values placed on property in order to determine the amount of taxes. The various governmental agencies have Code Enforcement officers that investigate a workplace to make certain a permit has been issued or is required and to determine if the workmen on the job are employees of a licensed and insured construction company. Another good practice is to ask the contractor to provide names and phone numbers of past but recent customers. Don’t be bashful – call them and ask the questions: “Did he produce a license?”, “Did he have his insurance agent send you certificates of insurance in the proper amounts of coverage?." This must also include Workman’s Compensation insurance. 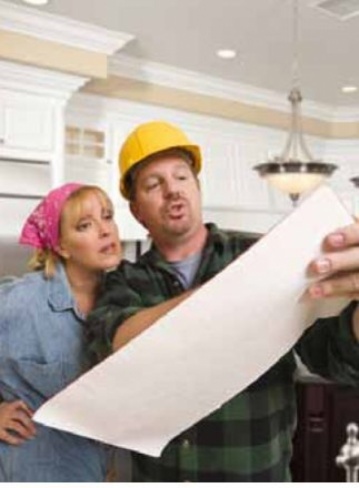 Is it really necessary to hire a licensed contractor? Yes. Just as you can’t drive your car with an expired or invalid license, you shouldn’t hire an unlicensed contractor.